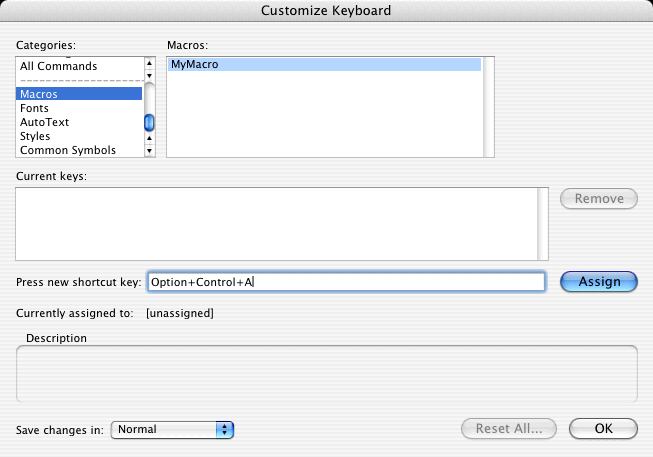 But you can also run macros from a menu, by clicking a toobar button, or by typing a keyboard shortcut. This is much more convenient when you need to run the macro frequently. This page assumes you have already created or recorded a macro. Macros live in modules, which are part of a document or template. 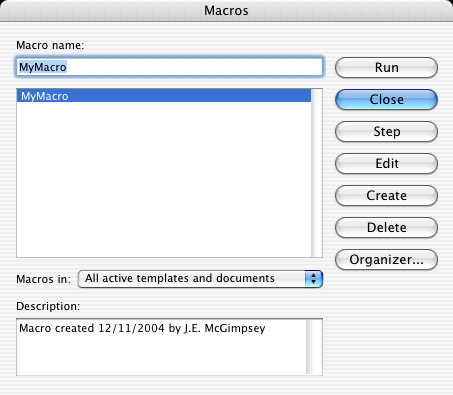 By default, recorded macros are placed in the Normal template in the NewMacros module. 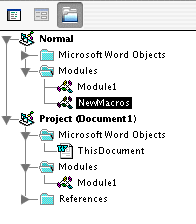 You can, however, rename the module, or copy and paste a macro to another module. Modules can have many macros, or they can have none (a module may be used to store global variables, for instance). To place a macro on a menu so that you can select it just like any other menu item, choose Tools/Customize/Customize Toolbars/Menus... The Customize dialog will open and an extra toolbar will appear just underneath the menu bar, that contains all the controls for the menu. 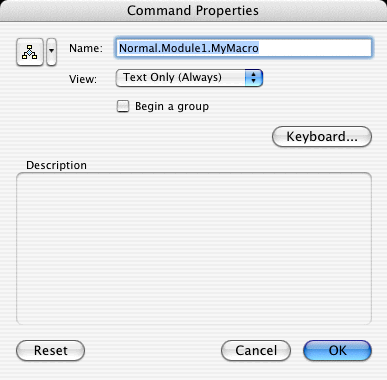 Click on Commands, then scroll down on the left hand pane of the dialog, and click on Macros. Click OK. 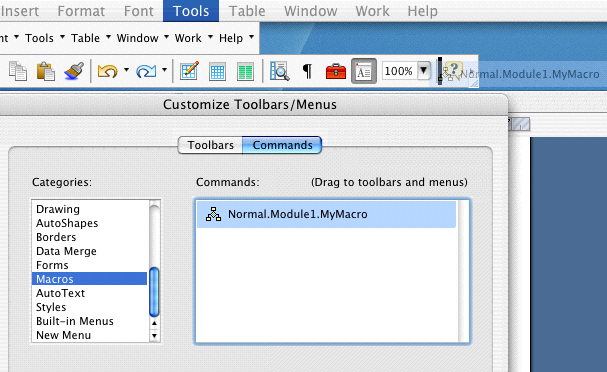 Your Tools menu now has a new control - the Normal.NewMacros.MyMacro item. See below for instructions on how to change the macro name in the menu. a thick black line will show you where the button will be placed. The button's face will have the name of the macro. See below for instructions on how to change the macro name on the button. You can assign a keyboard shortcut to a macro when you record one, but macros you write (or copy from other sources) can also be assigned a shortcut, just as any other command. 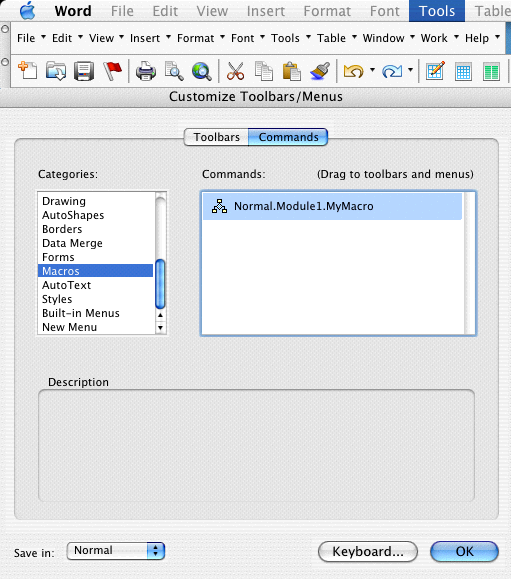 Choose Tools/Customize/Keyboard... and choose Macros from the Categories listbox. Select your macro and type shortcut in the indicated textbox. Make sure you click Assign. If you click OK instead, the shortcut won't be saved. Having a macro name of Normal.NewMacros.MyMacro is very specific as to where the macro's located, but you don't really need to know the location, usuually, and on buttons, it takes up a lot of real estate. Change the name to whatever you like. It changes only the name on the menu, not the name of the macro itself. Changing the button name is similar to changing the name in a menu. You don't have to go through the hassle of choosing Tools/Customize/Customize Toolbars/Macros... however. Just Ctrl- or right-click on the button and choose Properties from the pop-up menu. Change the name as to whatever you like in the Properties dialog. To copy a button image from another toolbar button, even from a button in a different Office application, in that button's Properties dialog, chose Copy Button Image from the Button Image pop-up menu, then choose Paste Button Image in the Button Image pop-up in your macro button's Properties dialog. 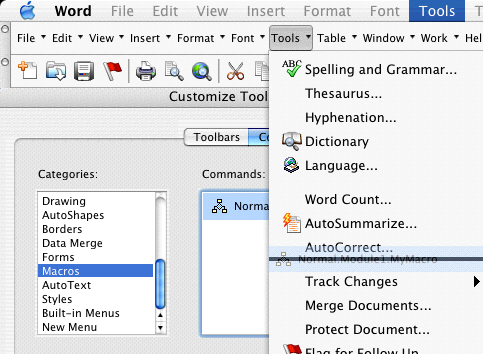 See Copy an image from one toolbar or menu command to another in Word Help. You can also create your own custom button faces - just copy any graphics image from a graphics program and use the Paste Button Image command. The graphic will be scaled to fit, so smaller images work best (20 x 20 pixels is the default button resolution). See Copy an image from a graphics program to a toolbar button or menu command in Word Help.